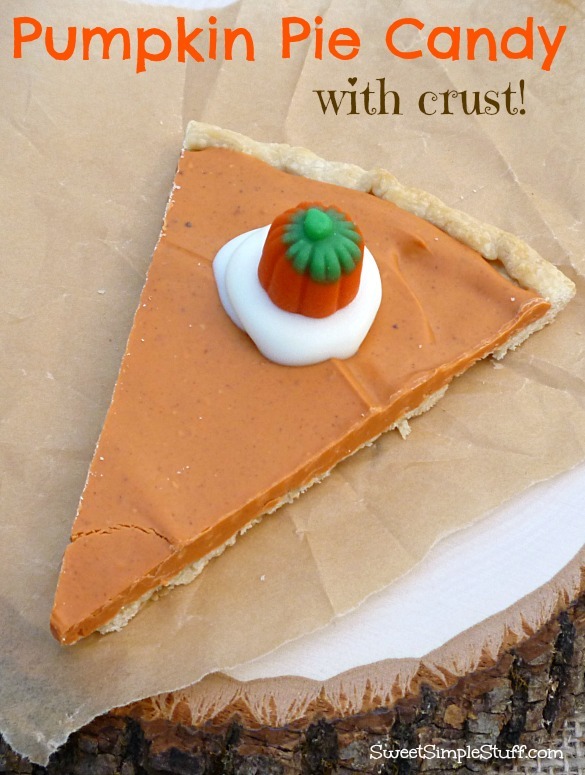 Do you like pumpkin pie and pie crust? Do you like candy? How about having fun with food? 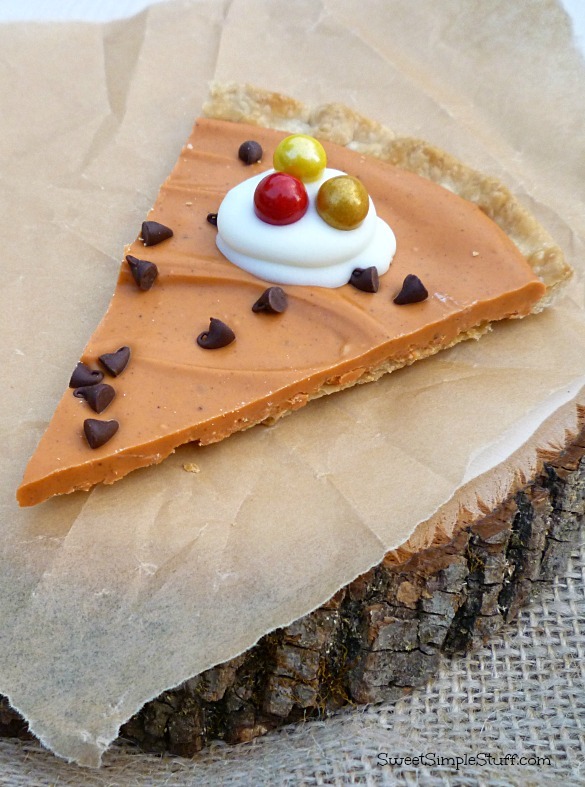 This is candy on pie crust! Kind of looks like pumpkin pie … doesn’t it? 2. Cover 2 baking sheets with parchment paper. Follow package directions for oven temperatures and handling dough. Spread dough on prepared baking sheets. Prick the dough several times with a fork. Fold the dough edge up about 1/2″ and crimp or pinch the edge, just like making a real pie. Chill for a few minutes. 3. Bake according to package directions. Please notice the crust on the right … I didn’t chill it … the edges didn’t hold their shape as well at the crust on the left. Let the crusts cool. 4. Melt 3/4 of the package (12 ounces) of CandiQuick in a medium bowl (I used a 4 cup measuring cup). Add a few drops of orange candy coloring. Stir in 1/2 cup of butterscotch chips (until melted) and 1 teaspoon of pumpkin pie spice … taste it! Add more butterscotch chips and/or pumpkin pie spice if you like! We like the flavor of butterscotch and used the whole cup of chips with 1-1/2 teaspoons of spice. Spread candy mixture over the two pies crusts. Add a few chocolate chips if desired. Chill for just a couple of minutes, then let it sit at room temperature until it’s totally firmed up. 6. No Photo … Wait for the candy to harden up and then wait five more minutes! 7. Cut the candy with the longest knife you own. Try not to use a sawing motion … just press down. 8. I cut each pie into 8 slices … cleaning off your knife between slices is helpful. 9. Melt the remaining 4 ounces of CandiQuick … this is the fake whipped cream for your fake pie. Add a small spoon of candy to each slice … let it sit a minute. 10. Add another little dollop of candy whipped cream on top of the first dollop … gives it a little dimension. Add candy garnish! Thank you to Miss CandiQuick for supplying the vanilla coating! Thank you to SweetWorks for supplying the Sixlets! 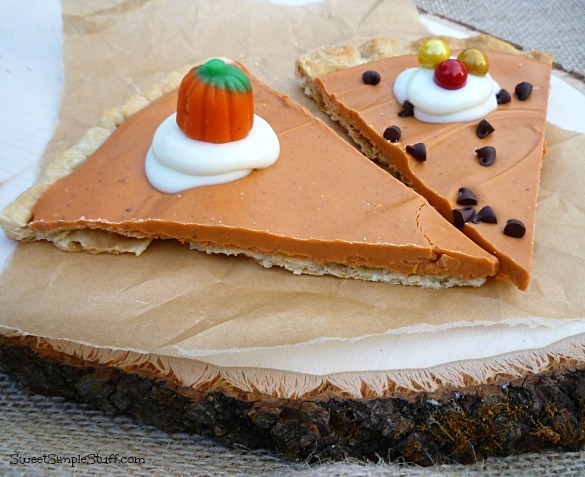 Pumpkin Pie Candy W/ Crust. It sounds good, I will have t see if my & granddaughter’s would like to Recipe to make it. Thank you Anna 🙂 I hope they are willing to give it a try! Wonder if a person could use a sugar cookie crust in place of pie crusts; you think? Thank you Colleen ;). I think that sugar cookie crust would be fine! Looks so much like real pumpkin pie, Brenda!